More than 6,500 nursing staff and healthcare workers were attacked last year. 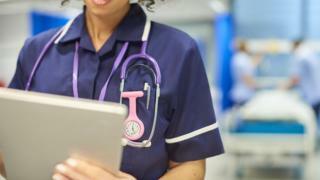 The figures were released by Northern Ireland's five health trusts. Almost 4,000 attacks were carried out on nurses in the Belfast Trust, while the Southern Trust recorded the lowest amount of incidents at 395. Chief Nursing Officer Charlotte McArdle said the incidents were "totally unacceptable". UNISON Union said the figures were "shocking" but not surprising. In total, 6,651 attacks were recorded across Northern Ireland. Of these incidents, 6,138 were directed at nurses, 97 at doctors and 416 on other healthcare workers. Belfast Trust reported almost three times the amount of attacks compared to the Western Trust, which ranks second on the list with 800 attacks. The South Eastern Trust recorded 542 attacks, the Northern Trust had 452 and the Southern Trust ranked the lowest with 395. "I am appalled to think that people who dedicate themselves to caring for others and saving lives are being subjected to verbal or physical abuse within their place of work," said Northern Ireland's Chief Nursing Officer. "These experiences have a hugely negative impact on their performance at work as well as physical and mental health of healthcare staff, and their personal and family relationships," added Charlotte McArdle. She went to explain, while there is a perception that these attacks occur in A&E Departments as a result of drug or alcohol abuse, "the majority of incidents are linked to persons with mental health and learning disability rather than any malicious intent". "Whilst many of these incidents are a direct result of illness employers need to understand how to meet their responsibilities to employees to fulfil their duty of care and to do that they have to understand particular issues associated with providing care in challenging and complex situations," she added. Regional Secretary of UNISON Union, Patricia McKeown said the issue of attacks is something regularly raised by members. "Despite the fact that we have secured policy decisions from a succession of Health Ministers on zero-tolerance of attacks on staff, staff are now working at critically low levels and the resources to protect them have not been made available," she added.